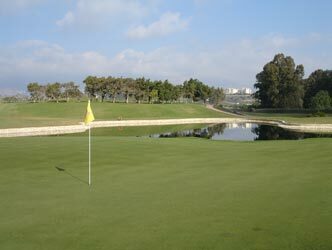 Santana golf is one of our clients most requested courses in the Fuengirola area. The course has breathtaking views of the Mijas mountains, close to the Mediterranean sea. The course is set in a former avocado plantation which provided a natural solution to many problems. The final result is a magnificent course with wide and well defined fairways on level terrain, hence easily walkable, where water features play an important albeit not excessive part in the overall design. Offert 1 gratis i varje 8 spelare,tom 31 December 2014 (gäller ej med twilight priser). Reducerat buggy pris, endast 15 euros per buggy, betalas direkt till GK.